STRATFORD – The Stratford football team is moving on the WIAA playoffs after a dominating rout of Northland Pines on Friday night at Tiger Stadium. The Tigers scored six first-half touchdowns, and held Pines to just 42 total yards and two first downs en route to a 41-0 whitewashing in a Division 5 Level 1 game. Stratford (8-2) moves on to a Level 2 game against Colby (8-2) next Friday, Oct. 26, at Tiger Stadium. Starting quarterback Max Schwabe tossed a touchdown pass and reserve Chandler Schmidt had two as the Tigers rolled out to a 41-0 lead by halftime. Kade Ehrike had a 22-yard touchdown run and junior back Chase Flink turned out to be the secret weapon for the Tigers, scoring three times. Flink caught a 23-yard touchdown pass from Schmidt in the first quarter, and added a 50-yard punt return for a score and a 22-yard TD run in the second for Stratford. Okley Wrensch had TD receptions of 17 and 89 yards in the victory. Stratford racked up 199 yards on the ground, led by Ehrike’s 60 on just six carries. 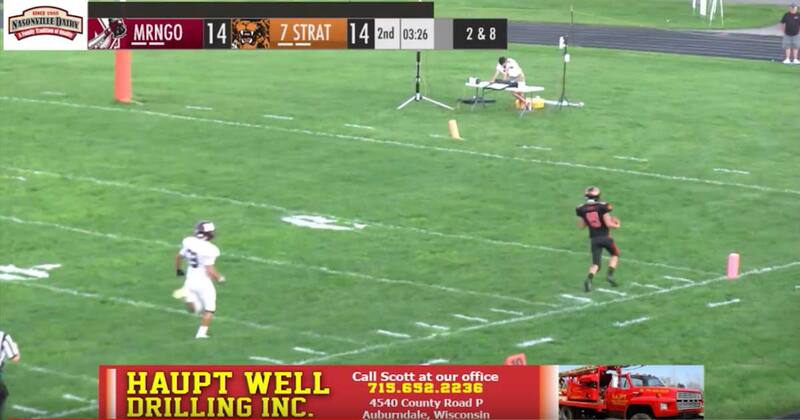 S – Kade Ehrike 22 run (Reed Curtis kick). S – Chase Flink 23 pass from Chandler Schmidt (PAT failed). S – Okley Wrensch 17 pass from Max Schwabe (Ehrike run). S – Flink 50 punt return (Curtis kick). S – Wrensch 89 pass from Schmidt (Curtis kick). S – Flink 25 run (kick missed). First downs: NP 2; S 18. Rushing (att-yards): NP 29-28; S 33-199. Passing (comp-att-yards-int): NP 2-2-14-0; S 8-10-224. Total yards: NP 42; S 423. Fumbles lost: NP 2; S 0. Penalties (no.-yards): NP 1-5; S 2-28. Rushing: NP, Blaedow 8-22, No. 34 3-12, Rhode 9-9, Hopkins 2-0, John 1-minus 2, No. 18 7-minus 13. S, Kade Ehrike 6-60, Matt Handrick 6-53, Chase Flink 3-39, Kale Weisenberger 4-12, Devin Dennee 2-11, Deyn Dahlke 3-7, Kainoa Gouvela 3-6, Justin Schoenherr 1-3, Eli Drexler 1-1, Beau Gross 1-1, Luke Gaulke 1-1, Chandler Schmidt 1-minus 4. Passing: NP, John 2-2-14-0. S, Schmidt 2-2-112-0, Max Schwabe 5-7-90-0, Flink 1-1-22-0. Receiving: NP, Blaedow 1-10, No. 18 1-4. S, Flink 3-54, Schwabe 1-22, Ehrike 1-6, Unaccounted 3-142. Fumble recoveries (defense): S, Handrick, Barten. Records: Northland Pines 5-5; Stratford 8-2.